When Stephen Curry and the Golden State Warriors clinched the 2015 NBA championship in a six-game series victory over LeBron James and the Cleveland Cavaliers, it was the perfect way to mark the 40-year anniversary of the Warriors’ last championship, when Golden State swept the Washington Bullets for the title in 1975. That Warriors squad was led by future Hall of Fame small forward Rick Barry. 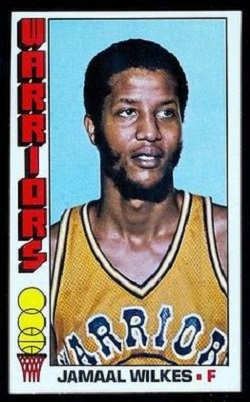 Sharing the frontcourt with Barry was a rookie named Jamaal Abdul-Lateef, publicly known as Jamaal Wilkes, who averaged 11.5 points, 9.8 rebounds and 1.8 steals per game in the ’75 Finals series. Abdul-Lateef was a two-time college national champion at UCLA who converted to Islam, then changed name during the same year he played his first NBA season and won his first pro championship. He would go on to win three more NBA titles with the L.A. Lakers and make the All-Star Game three times. He was inducted into the Basketball Hall of Fame in 2012. Muslim players have had a fairly consistent presence in the NBA since the 1960s, from Kareem Abdul-Jabbar and Zaid Abdul-Aziz, to Hakeem Olajuwon and Shareef Abdur-Rahim, to the dozen or so players who have populated NBA rosters in recent years. Schroder is one of the best backup point guards in the league, but he wants to lose that label sooner than later. If the 22-year-old can be patient and not allow his ambition to throw off Atlanta’s chemistry this season, he might be able to play for a championship in 2016 before he goes looking for a new home. The Hawks were a perennially good team that figured out how to be great last season, posting a 60-22 record to earn the No. 1 seed in the Eastern Conference playoffs, where they’d eventually lose to Cleveland in the conference finals. In a league that has become one in which most teams have one lead “superstar” who gets the majority of the credit and/or blame for the team’s results, the Hawks succeeded with a balanced attack led by four All-Star starters (PG Jeff Teague, SG Kyle Korver, PF Paul Millsap, C Al Horford) plus a fifth (SF DeMarre Carroll) who was named Eastern Conference co-Player of the Month in January. 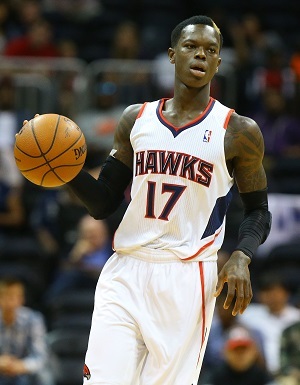 Schroder came off the bench for the Hawks to average 10 points and 4.1 assists in just under 20 minutes per game. Over the summer he was the starting point guard for Germany in the FIBA Eurobasket tournament, averaging 18.2 points and 7.5 assists. He is a good young player with a lot of potential, but he’s not going to beat out a healthy Teague for the job he wants in Atlanta, so he may be on a new team by this time next year. Very few, if any, NBA fans or media members knew that Waiters was a Muslim until he became the centerpiece of a misunderstanding over the “Star-Spangled Banner” that (Alhamdulillah) ended before the public had time to turn on Waiters like they turned on Mahmoud Abdul-Rauf a decade earlier. A couple of months after that near-controversy, Waiters was traded from Cleveland to Oklahoma City — his role changing from a volume-scoring sidekick for LeBron and Kyrie Irving to a volume-scoring sidekick for Kevin Durant and Russell Westbrook. Waiters averaged 12.7 points as a part-time starter with the Thunder, and now gets the benefit of an entire training camp to bond with his new teammates and first-year coach Billy Donovan. For someone who was a top-10 draft pick just five years ago, Aminu has had a journeyman-like career, playing for three teams in his first five seasons as a pro. But a strong (albeit brief) playoff run with the Dallas Mavericks last season (11.2 points, 7.2 rebounds, 2.0 steals per game) helped him earn a four-year, $30 million contract with the Trail Blazers in free agency and perhaps a long-term NBA home. 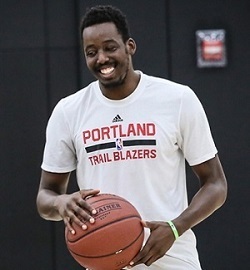 A backup more often than a starter in his previous stops with the L.A. Clippers, New Orleans Pelicans and Mavericks, Aminu is slated to start for Portland, a team that is rebuilding after losing All-Star PF LaMarcus Aldridge and three other starters during the offseason. Insha’Allah, from here on out, Teletovic will view every minute of his NBA career as a blessing. While playing for the Brooklyn Nets last season, the 30-year-old husband and father of four from Bosnia & Herzegovina was found to have blood clots in his lungs — a condition that can be fatal and has ended athletic careers. After sitting out for only three months, Teletovic returned to the Nets just in time for the playoffs, where he played sparingly as the team was eliminated in the first round. During the offseason, he signed a one-year deal with the Suns, an uptempo squad that likes to run and shoot a lot of three-pointers. That just happens to be Teletovic’s specialty; he averaged 7.0 points while shooting 36 percent from three-point range in his three years with Brooklyn. Like many second-round draft picks hailing from countries outside of the U.S., Aldemir was what they call a “draft and stash” player: one who is already under contract with a pro team in another league, whose draft rights become the property of an NBA team that will keep tabs on them for a year or more while deciding when (or if) to actually bring them to the States. That’s how it came to be that Aldemir was already on his third NBA team by the time he made his NBA debut. He was drafted by the Clippers in 2012, traded to the Rockets that same night, and traded again to the 76ers a year later while still playing pro ball in Turkey. The 6-foot-10 Aldemir finally played his first NBA game in December 2014, and finished last season averaging 2.3 points and 4.3 rebounds in a reserve role for the rebuilding and recently repugnant Sixers. Last season was supposed to be Faried’s big leap from intriguing potential to All-Star production. During the 2014 offseason he had helped Team USA win a gold medal at the FIBA World Cup, signed a $50 million contract extension with the Nuggets, and had become one of the most visibly marketed players in the NBA — a credit to his power-dunking style and Magic Johnson-like smile. 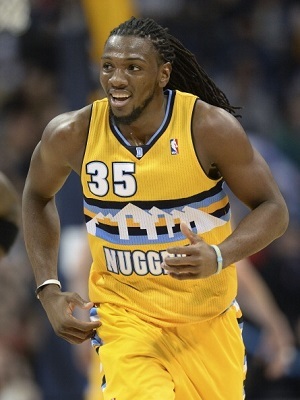 And so predictions were made and expectations were set that Faried would take his place among the league’s top power forwards and perhaps lead the Nuggets back to the playoffs. That didn’t happen. Faried didn’t have a bad season; he just did pretty much what he’d done the year before, averaging 12.6 points and 8.9 rebounds while receiving little to no All-Star consideration and failing to lead Denver anywhere near the postseason. After firing its coach and trading its point guard, the Nuggets begin a new era with a nucleus of Faried, rookie point guard Emmanuel Mudiay, second-year center Jusuf Nurkic, and veteran scoring forwards Danilo Gallinari and Wilson Chandler, led by first-year coach Mike Malone. Ilyasova played for the Milwaukee Bucks for seven seasons, through good times (three playoff appearances), bad times (four non-playoff seasons) and some really bad times (a league-worst 15-67 record two years ago). Just when the franchise seemed to be building a solid foundation for the future — making the playoffs last season and putting a scare into the favored Chicago Bulls in the first round — Ilyasova was traded to the Pistons, a once-great franchise fallen on hard times that is trying to get where the Bucks are currently. Ilyasova averaged 11.5 points last season while attempting a career-high 3.3 three-pointers per game. The Pistons are bringing in the veteran nicknamed “Turkish Thunder” as a long-range shooting “stretch four” power forward, so expect that number to go up. If Anthony Davis fulfills the predictions many have made and wins league MVP this season, a piece of the trophy will likely belong to Asik. Davis stands 6-foot-10 with long arms, bouncy legs and shot-blocking instincts; a lot of coaches would immediately stick him under the basket, tell him to stay there and simply swat everything he can get his massive hands on. With the Pelicans, however, the unfairly skilled and versatile Davis is allowed to roam free around the court while the the 7-foot, 255-pound Asik handles the grunt work around the rim. After backing up All-Star centers Joakim Noah in Chicago and Dwight Howard in Houston, Asik found his home as the starter in New Orleans, averaging 7.3 points and 9.8 rebounds last season. In just under 18 minutes per game during his rookie year, in just 62 appearances (he missed time with ankle and knee injuries), Nurkic showed enough (6.9 points, 6.2 rebounds per game) to be tagged as an integral part of Denver’s latest rebuilding plan — a plan that has been revamped a few times already since the franchise traded away Carmelo Anthony in 2011. Nurkic put together a handful of double-doubles during the season, but it was the 21-year-old’s last impression that left the most lasting impression. In a close loss to the eventual NBA champion Warriors on national TV on the final day of the regular season, Nurkic posted a season-high 17 points and grabbed nine rebounds. Toward the end of last season, Dieng was playing well enough that it appeared the Wolves would have a close position battle this season for the starting center spot between the 6-foot-11, 25-year-old Dieng from Senegal and 6-11, 29-year-old Nikola Pekovic from Serbia. But then Minnesota won the NBA Draft Lottery and used the No. 1 overall pick on University of Kentucky center Karl-Anthony Towns, which means Dieng and Pekovic will now be fighting for the right to not be buried on the bench as a third-stringer. The Wolves are a mix of veterans near the end of their careers (Kevin Garnett, Andre Miller, Tayshaun Prince) and youngsters whose best days are yet to come (Towns, Andrew Wiggins, Zach LaVine); Dieng is considered more the latter than the former, but his winning experience as a national champion at the University of Louisville and his high basketball IQ make him an ideal leader among Minnesota’s young pups. It was probably the most surprising and certainly the most scrutinized contract signed during the NBA offseason. After coming to the Thunder in a February trade from the Utah Jazz, Kanter averaged an impressive 18.7 points and 11 rebounds in 26 games with OKC, who fell just short of a playoff berth. Kanter entered the offseason as a restricted free agent, meaning that if he reached an agreement with another team, the Thunder would have three days to match the offer and keep the 23-year-old, 6-foot-11 center from Turkey. The Trail Blazers raised some eyebrows when they offered Kanter a four-year, $70 million deal, and the Thunder raised even more eyebrows when they matched the offer. 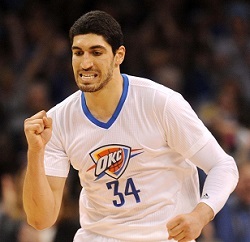 Such a big contract would seem like an obvious sign that the Thunder view Kanter as one of their top players. However, going into this season, he may not even start; throughout training camp Kanter was in a position battle with 22-year-old seven-footer Steven Adams.